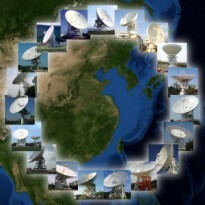 China, Korea and Japan have several VLBI stations in the countries, and currently each country operates a VLBI network for each. The East Asia VLBI Network (EAVN) is a collaborative project to combine VLBI networks in East Asia, with a longest baseline of 6000 km. The EAVN can be extended as the Asia Pacific antenna (APT) with an inclusion of Australian telescopes. The EAVN/APT collaboration has started since 2004.